One of the more popular types of rugs in the market place these days in known as Kazak. Truth be told, there are two distinctly different types of Kazak. One is the traditional old Kazak woven previous to the 1900’s. The other is a newer type of Kazak based on the older designs that comes form Afghanistan. The older Kazak were woven by the Armenian people. In fact, Kazak is one of the more famous Armenian weavings. Done in the area of Turkey south of the Caucasus, Kazak were known for using geometric designs, high quality wool and fine knot counts. 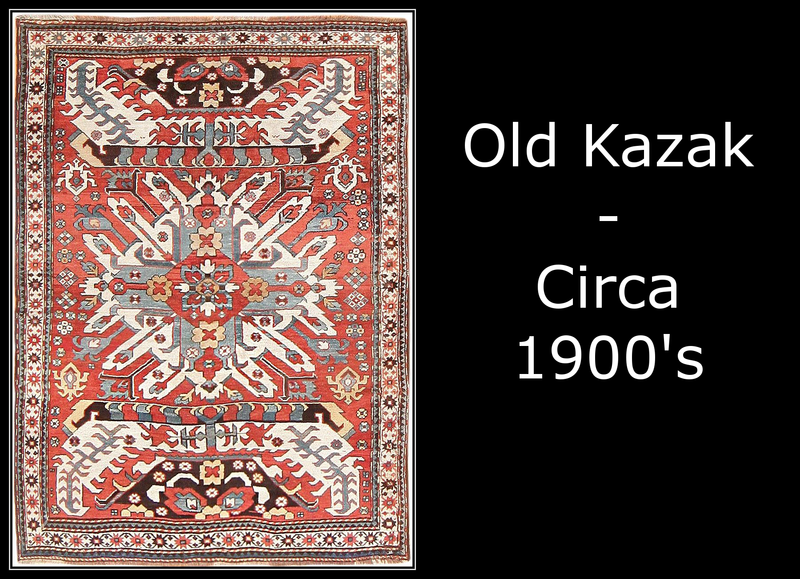 Known for their large scale patterns and usually high contrasting colors, Kazak rugs tend to be very distinct. Some Kazak use a palette of colors in the blue and red ranges while others are very bright delving into the greens and yellows. Generally they are woven in wool on a wool foundation and use Turkish, or symmetrical, style of knotting. 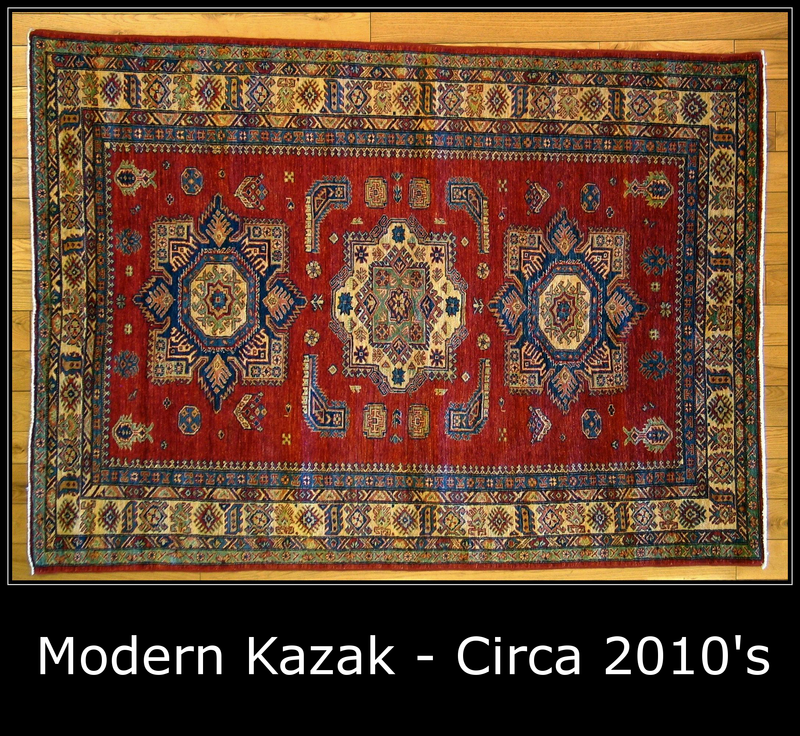 Due to their nature, colors, and age Kazak rugs tend to be considered very collectible. The newer Kazak have a different origin. In the early to late 1990’s, many Afghani refugees had been forced to relocate to Pakistan. Lacking any form of consistent income, they turned to weaving to try and support themselves. During this time frame, many designs moved away from the traditional dark red and black Afghani patterns and into a broader spectrum of colors and patterns. In the early 2000’s, after the US invasion, most of these refugees traveled back to Afghanistan. They took with them some of the new patterns and techniques that they had learned and developed while in Pakistan. As such, many modern Afghani rugs have branched outward from their normal weaving traditional. Modern Kazak were born out of this. Based on the old Turkish Kazak patterns, these modern Kazak use bright bold colors, strong geometric motifs, and hand spun wool. Unlike their older counterparts, modern Kazak are woven with cotton foundations. Most are woven using Ghazni wool harvested form sheep raised the in Ghazni mountain ranges of Afghanistan. This wool is very dense and makes for a very strong rug. As such most modern Kazak to last well into the late and even next century. Previous Previous post: Our 2016 Woven Treasures Calendars are almost here!